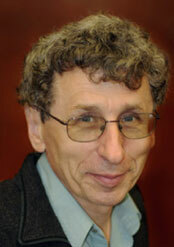 Victor Flambaum is professor at the Department of Theoretical Physics at the University of New South Wales in Australia. He is one of the very few cases of a physicist who is still able to master all of physics in its breadth and its depth and has published in diverse fields of research such as nuclear physics, particle physics and cosmology, solid state physics and statistical physics. He is best known for his calculations of parity violation in atoms and has more recently become well-known for his studies of time-varying fundamental constants and his proposal of new experimental ways to search for the possible time dependence of the ratio of proton to electron masses. Flambaum is known for his unique way of combining theoretical with experimental physics. As GRC fellow, he will spend some months per year at Mainz in order to collaborate with his colleagues at the Helmholtz Institute Mainz and the Institutes of Physics and for Nuclear Physics at JGU. He will also be involved in the cutting edge research at the PRISMA Cluster of Excellence. Press release "Physicists analyze the rotational dynamics of galaxies and the influence of the mass of the photon"
Press release "Atomic parity violation research reaches new milestone"
Press release "Victor Flambaum becomes new fellow at the Gutenberg Research College at Mainz University"